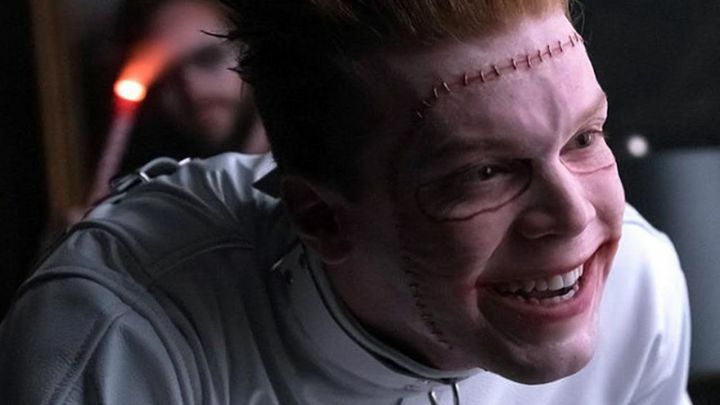 Jerome lives on Gotham, but only after stapling his own face back to his head. In a new “white band” trailer for Gotham, Jerome’s return as the Joker (or at least Joker-like villain), we see Jerome return to the city with his old face and Bruce Wayne as his hostage. Viewers finally know the answer to whether or not Jerome will return as the Joker on Gotham, and why exactly he has to wear a face mask. As it turns out, Jerome’s death spawned a legion of cult followers who worshiped his legacy. After an attempt by the cult leader to resurrect the deceased Jerome, they resorted to stealing his face and using it as a kind of flesh mask crown. Unfortunately for them, Jerome did successfully come back to life, and he wanted his face back. The rest of Jerome’s return involves a literal murder circus set up in Gotham City, and Bruce Wayne appears to be the guest of honor. This trailer makes Gotham look the most cinematic it’s been since the show began, though that’s partially due to the numerous references to Christopher Nolan’s The Dark Knight. Everything from the dynamite execution, to Jerome’s new voice, is evocative of Heath Ledger’s performance as the Joker in Nolan’s film. However, Jerome is clearly modeled after the New 52 Joker, who surgically removed his own face, only to wear it as a mask. It’s an interesting fusion of two Jokers, but this new direction certainly looks like the bloodiest incarnation of the Joker Batman fans see on screen. Gotham: Mad City airs Mondays at 8/7 central on FOX.